How your donations have supported the people of Greece in 2015. 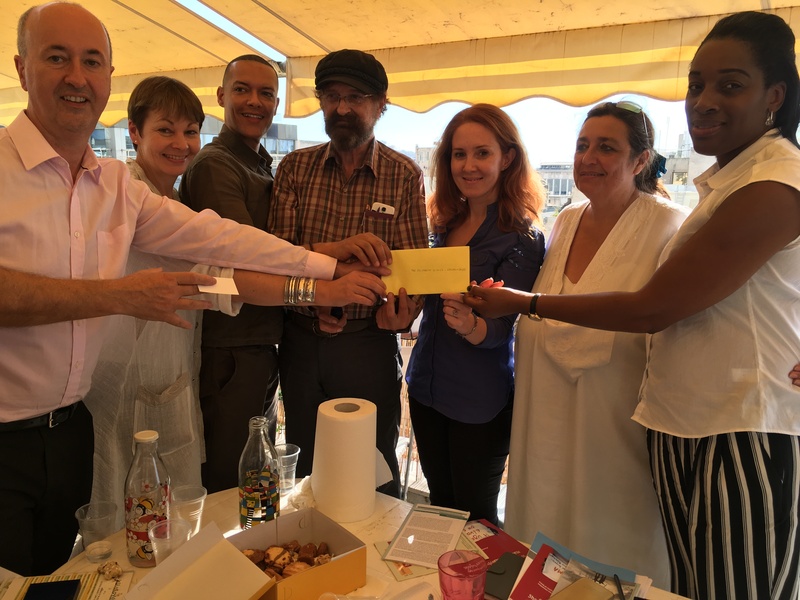 Many people donated to the Greece Solidarity Campaign and our Medical Aid for Greece Fund either by post, online or by attending our fund-raising dinner during the tumultuous year of 2015. 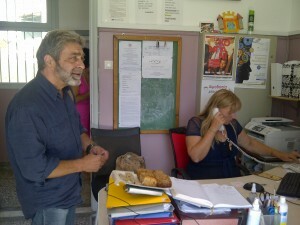 We passed on your donations to the Solidarity Clinics and Pharmacies and Food Projects in Greece. In October 2015, our GSC delegation presented 2500Euros direct to KIFA -the Athens Social Clinic and Pharmacy by Omonia in central Athens (left below) and 4300 Euros to Solidarity for All for distribution to the solidarity clinics on the islands and in Athens (right below – delegation presentation of funds at the Committee of Solidarity Clinics in Athens). We visited Kalamata Solidarity Clinic and Pharmacy in September and in November 2015 donated direct £2635 for a much needed dental xray machine and basin which is now installed. See report below. 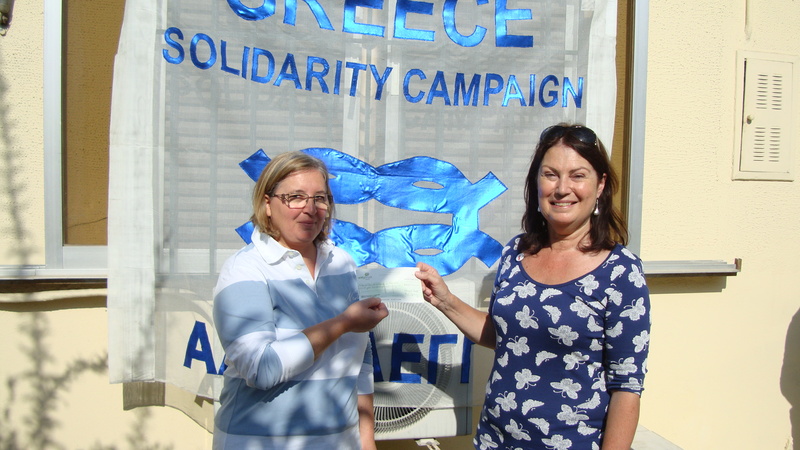 In November our GSC treasurer Cherry Sewell and fundraiser Vivianne Lakra presented 5420 Euros to Solidarity for All to support the Solidarity Clinics in Athens. These funds were raised by the crowdfund earlier in 2015. They also presented 6190 Euros donated to GSC to the Solidarity for All for the Food Solidarity Projects established in Athens. 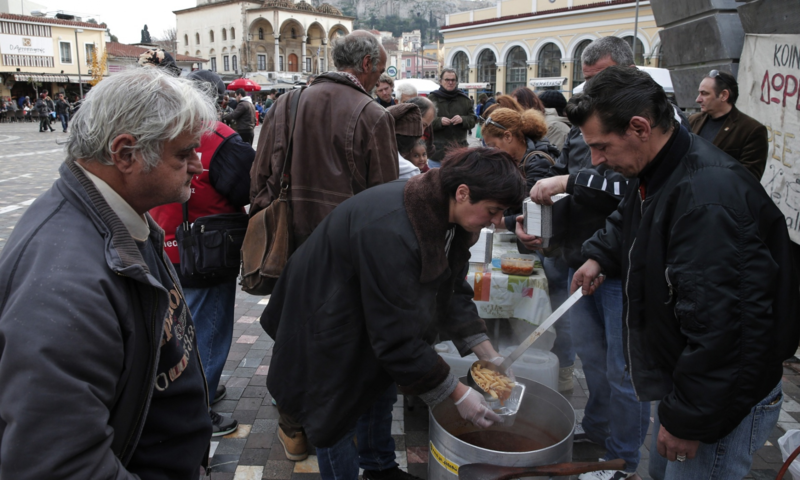 Below is the inspiring community self-help Food Solidarity Project in Piraeus which has developed an alternative currency. 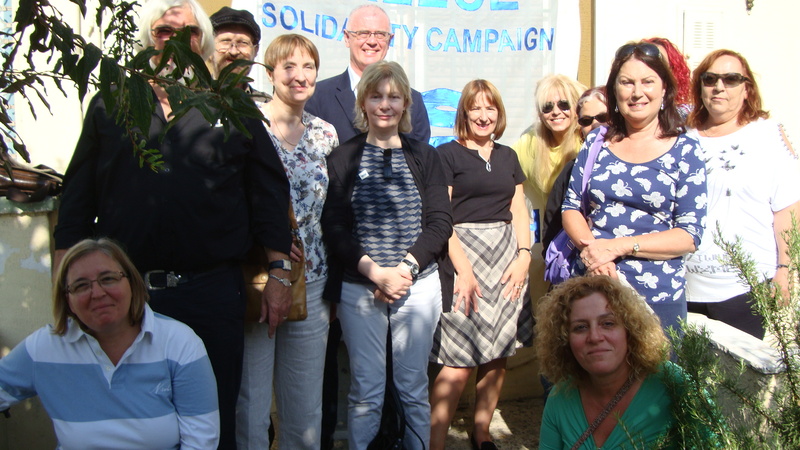 The Greece Solidarity Campaign visited the Clinic in September 2015. The building, a derelict wing of the old hospital, was first occupied by activists when the mayor refused to let a solidarity clinic be established there. They renovated it so that it now houses a Solidarity Clinic with waiting room, examination room, children’s examination room, dentist and pharmacy. 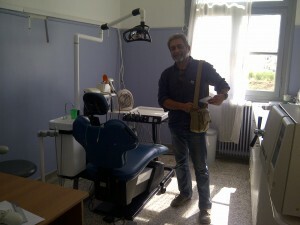 It is operated by 200 volunteers and a network of over 60 volunteer doctors who cover the whole region of Messinia. Watch this short film explaining the clinic here. 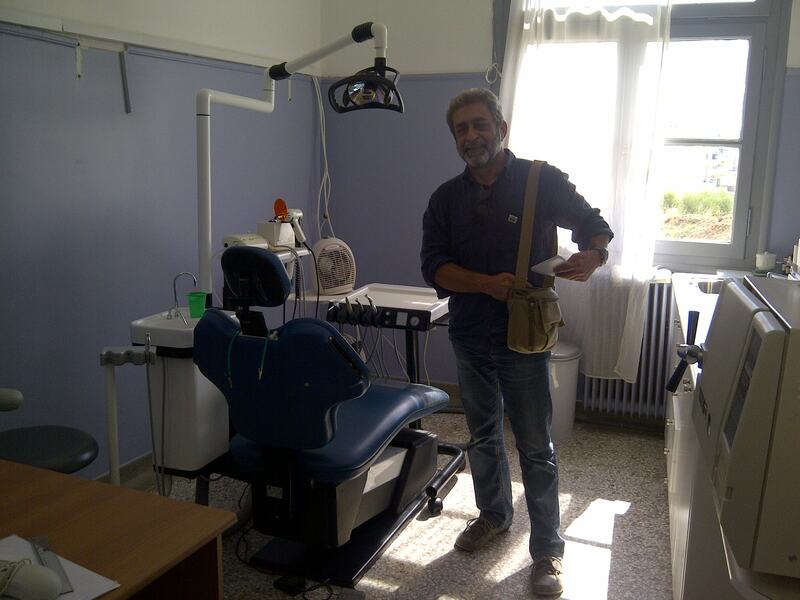 A Reuters report (November 2015) on the shocking state of children’s teeth in Greece highlights how years of severe austerity, mass poverty, the collapse of the public health service and inability of people to pay for dental care have led to this crisis in dental health. 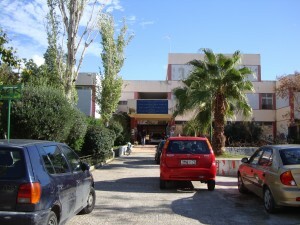 The ‘Pharmacy of Solidarity’, in the Athens suburb of Patisia used to be a community surgery for children’s health, run by the City Council and staffed by a school doctor , but it was closed because of the cuts. Housed in the modest rooms of the Cultural Centre by the large Grava Schools, the clinic brings together parents, teachers of the OLME secondary school teachers’ union, activists and volunteers. 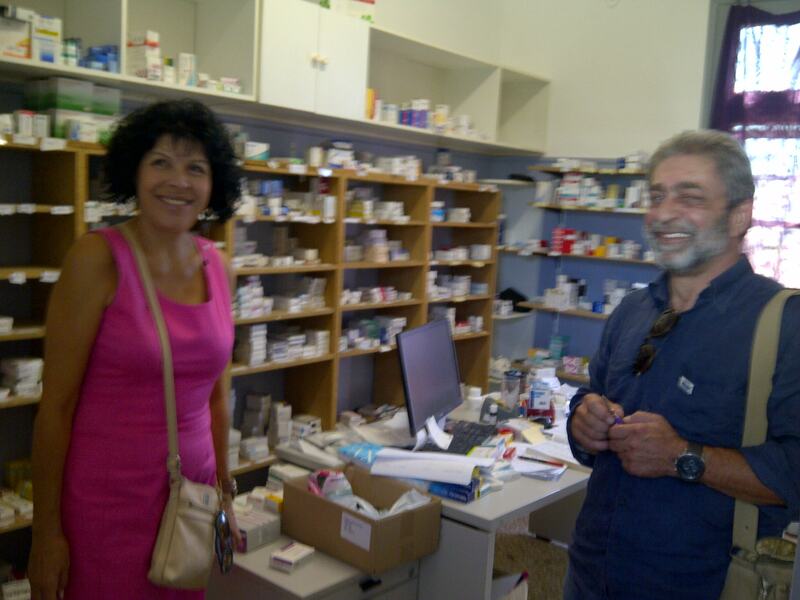 The Solidarity Pharmacy welcomes people without social insurance, including immigrants and those without homes, who have a medical prescription. It serves them for free using mainly donated medicines and supplements. More complex prescriptions, so-called ‘red line’ ones, are not dispensed. The Pharmacy has built up a network of doctors with whom they co-operate when someone doesn’t have a prescription but needs treatment. Presently, the Pharmacy opens three days a week. 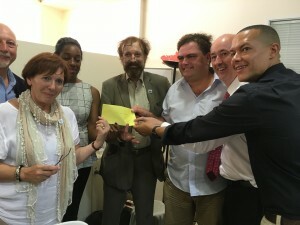 Regular pharmacies in the locality co-operate and refer people to the Solidarity Clinic when they see people who cannot afford to pay for a prescription. 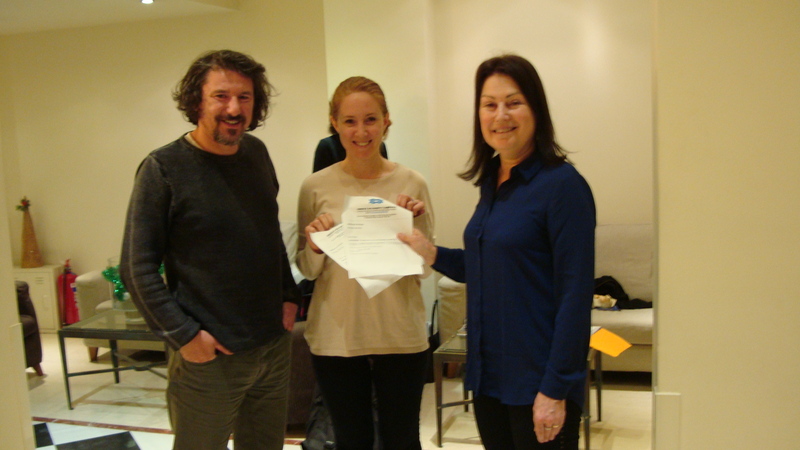 When GSC visited again in November 2015, we learnt that with the mass influx of refugees , Patissia clinic, along with other Athens Solidarity Clinics, are working double shifts – one at the clinic and one with the refugees either at the camps or welcoming them with survival packs at the Piraeus docks. 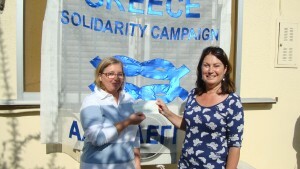 GSC Medical Aid for Greece donated funds via Solidarity for All to the Patissia Clinic in early 2015. In 2016 we are now collecting funds to buy diabetic test strips for their diabetic patients. 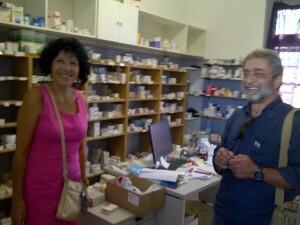 The Patisia Solidarity Pharmacy spawns other initiatives. 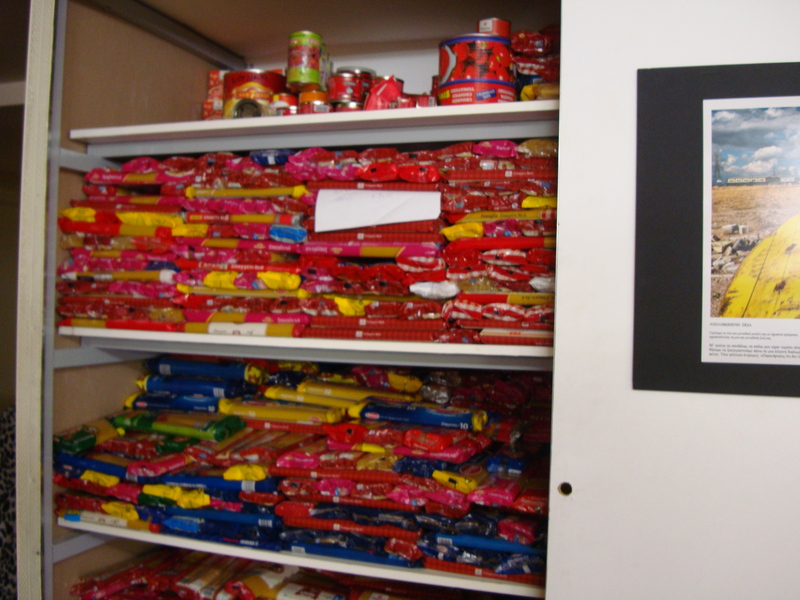 Food is a big concern with many people struggling to feed themselves. There are 9,000 students in the Grava Schools, where the Pharmacy is housed. The teachers have secured City Council support for 500 free meals a day for vulnerable children, but they are campaigning for this to be increased to 1,000 free meals a day, such is the need. Teachers see first-hand the drastic effects on families of five years of cuts and austerity in the public sector. They have responded with great ingenuity and commitment. 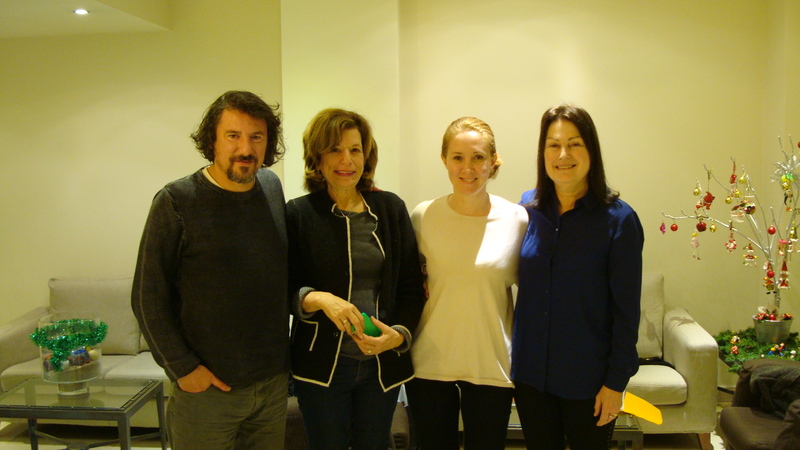 At the Grava schools and elsewhere, teachers from the OLME union and other unpaid volunteers give free lessons in Greek and other subjects to support students who need extra help. In Greece there is compulsory education for children aged between six and fifteen years. Many teachers have lost their jobs as more than a thousand schools have been closed or amalgamated, with big increases in class sizes as a consequence, so the need for extra coaching is acute in a system where, formerly, this was prevalent amongst more prosperous families who paid for it. Those teachers who have retained their jobs have suffered big cuts in their salaries. Training for young people aged 16 to 18 years has been particularly badly hit. ‘Poor kids are being dumped,’ in the words of one of the volunteers at the Solidarity Clinic. As many as one in two young people are not in training nor in employment. 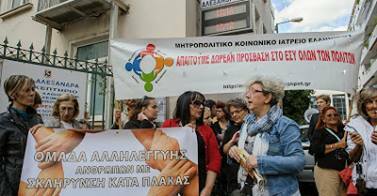 ‘Our aim is to defend our rights and our dignity and to put in practice the meaning of solidarity.’ The Pharmacy of Solidarity at Patisia . 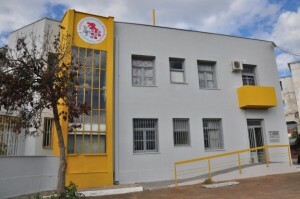 The Social Solidarity Clinic in Peristeri, Athens. The GSC Delegation presented funds in October 2014 which were spent on an ECG machine and other medication for the clinic. When we visited in November 2015 they told us they had had to start food solidarity distribution. 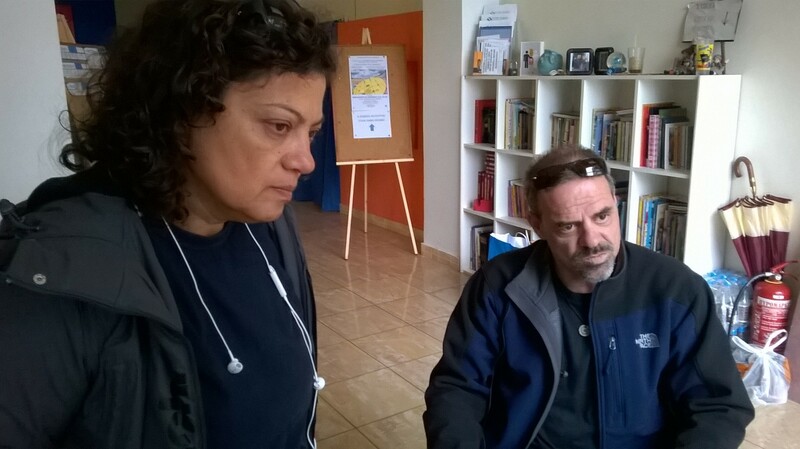 They are also working with refugees at the camps in Athens. Giorgos Vichas, a 55-year-old cardiologist, runs a clinic in a prefabricated building on the old Elleniki air base in the southern part of Athens. He works for free, as do 90 other doctors, and almost all fields of medicine are represented. 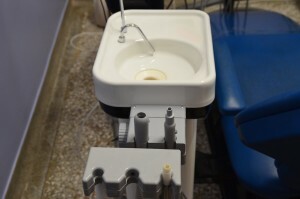 Medical equipment, beds, chairs and drugs are all donated. Vichas and his colleagues do not accept money. For almost two years now, they have served as a stand-in for the government, which can no longer guarantee basic medical care for its citizens, because they in turn can no longer afford their health insurance policies. Up to 3,000 patients a month go through the waiting room, which looks like a makeshift bus stop, and the numbers continue to rise. The Clinic provides free medical assistance to the unemployed and poor people with no social security or with very little income. 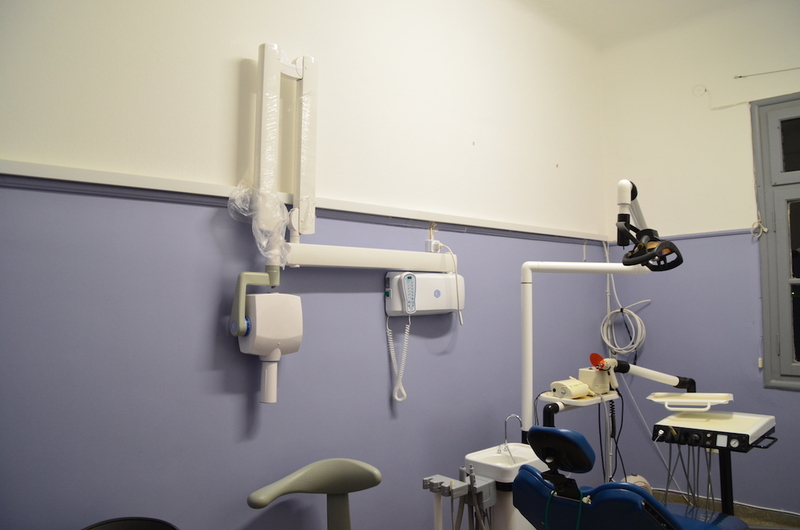 At first glance, the clinic is a symbol of the hardship Greeks are going through. 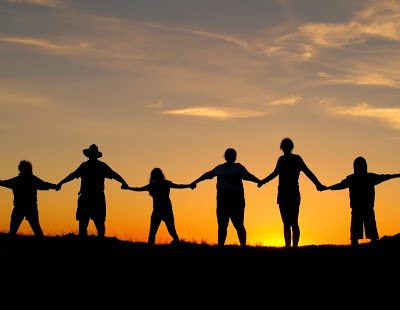 But it is also proof of a new communal spirit. See the clinic’s report of our visit Here and also you can read here more about the visit of the delegation from Britain (Matt Wrack, General Secretary, Fire Brigades Union ; Dave Green, National Officer, Fire Brigades Union; Sharon Riley, National Officer, Fire Brigades Union; Geoff Revell, Peoples Charter and RMT; Pilgrim Tucker, Community Coordinator, Unite the Union; Jane Beach, Professional Advisor (Health) Unite the Union; Andy Love MP; David Lammy MP; Daniel Trilling, editor and journalist, New Statesman; Mike Davis, editor Chartist magazine; Isidoros Diakides, Greece Solidarity Campaign; Rachel Newton, Greece Solidarity Campaign; Joseph Healey, Greece Solidarity Campaign and Queers Against Cuts; Beniamino Barresse, Greece Solidarity Campaign and independent film-maker). A peaceful protest at Alexandra Hospital on 17 October 2013. 17th October was the day of action of the Volunteer Community Clinics and Pharmacies in hospitals all across the country. 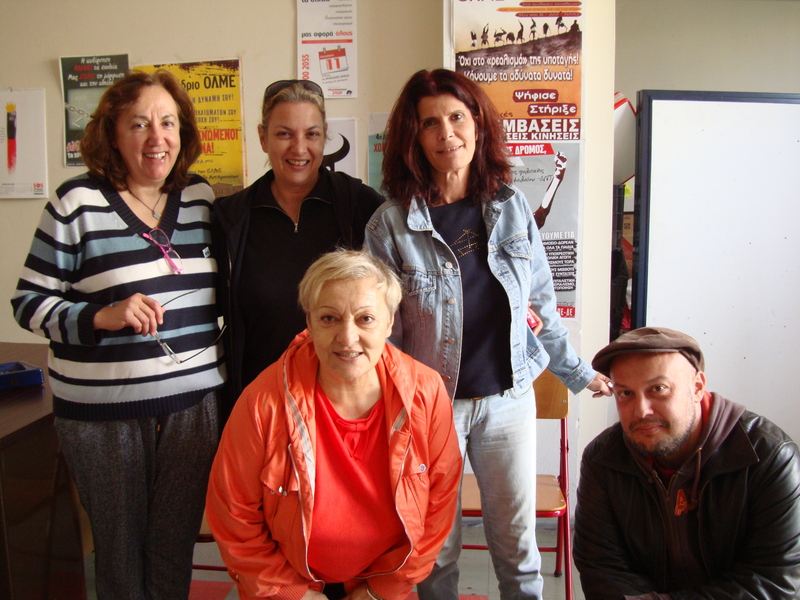 The Metropolitan Community Clinic at Helliniko, The Community Clinic and Pharmacy for Solidarity of Athens, the Society of Cancer Patients, Volunteers, Friends and Physicians (KEFI) and The Team for Solidarity for those with Muscular Sclerosis all participated. The protest was to give a strong voice to women’s organizations, and the movement “I will not pay”. Doctors and nurses of the hospital and as well as our patients and private citizens, took part. The aim of the protest was to demonstrate, yet once again, that all must have equal access to health care including, of course, the uninsured. A delegation of the protesters met the assistant director of the hospital. She gave a personal undertaking that the hospital will accept, from here on, uninsured pregnant women who will be able to give birth with dignity and that there will be no cost passed on to them, or costs passed on to their tax debt. This is a significant step in our battle to open the state hospitals to all uninsured citizens. This, the state is obliged to do, but does not do . But the employees of the hospitals, in solidarity with ordinary citizens, are doing what they can to honor this obligation. We gave a clear message of the inalienable right of all to LIFE and DIGNITY. We have asked for a written confirmation of the hospital’s undertaking. We will continue our struggle with the same unwavering firm stance that ALL HAVE A RIGHT TO LIFE.